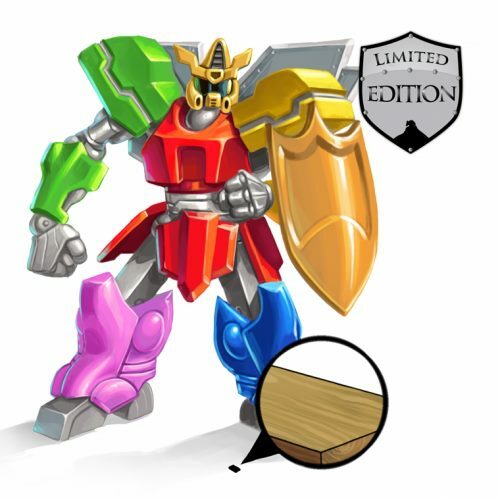 The Ultra MegaMouser MechaBot Trap is a Limited Edition Physical type weapon. Traditionally, these super-robots are formed of smaller robots that link together in times of great need, but when you build the whole thing from scraps all at once, you kind of limit your options. Plus, look at the size of the thing! When you work on a scale of that magnitude, you run into special engineering constraints that mean you have to make trade-offs: Either you can link together from smaller robots, or you can have your super robot stay together for more than one impact. Unfortunately, due to its massive size, the Ultra MegaMouser MechaBot Trap isn't terribly effective against most mice. Mice are swift and hard to track, and the Ultra MegaMouser MechaBot Trap is slow and ponderous. Still, against other super-robots, it's pretty swell! The Ultra MegaMouser MechaBot Trap is a Limited Edition weapon and can no longer be acquired by Hunters. It could be purchased for 10 Pink Leg Robot Scraps, 10 Blue Leg Robot Scraps, 10 Green Arm Robot Scraps, 10 Yellow Arm Robot Scraps, 10 Red Chest Robot Scraps, and 1 Repurposed Robot Head. It could not be refunded. The Repurposed Robot Head could be purchased from Ronza's Traveling Shoppe General Store for 100,000 gold. 7 March 2013: The Ultra MegaMouser MechaBot Trap was introduced during MouseHunt's Fifth Birthday event. Hunter were required to arm this weapon in order to attract the Super FighterBot MegaSupreme during MouseHunt's Fifth Birthday. This page was last edited on 13 January 2019, at 13:31.